Brown is Purdue's newest Community Cluster and is optimized for communities running traditional, tightly-coupled science and engineering applications. Brown built through a partnership with Dell and Intel in October 2017. 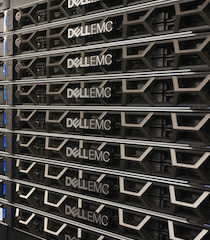 Brown consists of Dell compute nodes with two 12-core Intel Xeon Gold "Sky Lake" processors (24 cores per node) and 96 GB of memory. All nodes have 100 Gbps EDR Infiniband interconnect and a 5-year warranty. To purchase access to Brown today, go to the Cluster Access Purchase page. Please subscribe to our Community Cluster Program Mailing List to stay informed on the latest purchasing developments or contact us via email at rcac-cluster-purchase@lists.purdue.edu if you have any questions. Brown is named in honor of Herbert C. Brown, Nobel Laureate and Professor of Chemistry. More information about his life and impact on Purdue is available in an ITaP Biography of Brown. All Brown nodes have 24 processor cores, 96 GB of RAM, and 100 Gbps Infiniband interconnects. Brown nodes run CentOS 7 and use Moab Workload Manager 8 and TORQUE Resource Manager 5 as the portable batch system (PBS) for resource and job management. The application of operating system patches occurs as security needs dictate. All nodes allow for unlimited stack usage, as well as unlimited core dump size (though disk space and server quotas may still be a limiting factor).